Child maltreatment is complex to study. It requires analyzing the interactions among and within systems, including individual factors. Interventions for the prevention from and response to child maltreatment cannot be adequately designed if there is no clear understanding in which community members define child abuse. The book examines the diverse and rich knowledge basis that exists in the community in conceptualizing child maltreatment. It sees the multiple perspectives of child maltreatment (meaning, types and etiology) as comprehended by children, youth and adults living in an urban area. It explores the link between the conceptualization of child maltreatment against the neighborhood conditions. The work advances the necessity of the primary consideration of context specific prevention of and response to child maltreatment. 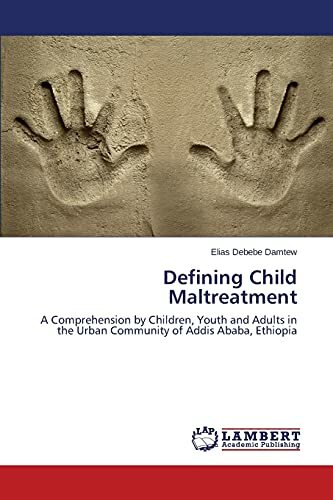 It helps social work research gain multiple perspectives to build a more concrete comprehension of child maltreatment in an urban context in Ethiopia. Hence, it sheds light to students, researchers, practitioners and policy makers who wish to further studying child maltreatment considering multiple settings (cultural, socioeconomic and individual). The author studied Geography and MSW at Debub University, Dilla and Addis Ababa University respectively. He has extensive work experience in the field of Education and Social Work at governmental and non-governmental organizations.